When you are dealing with multiple registrations in many countries around the world, the ability to manage them effectively and remain under control is important. At any given time, you should have access to the exact status of each product’s approval in each market so you are able to take the necessary actions to maintain, renew, transfer or amend your registrations. Enter the Global Registration Map (GR-MAP™), a unique feature only available on the new Licensale platform. 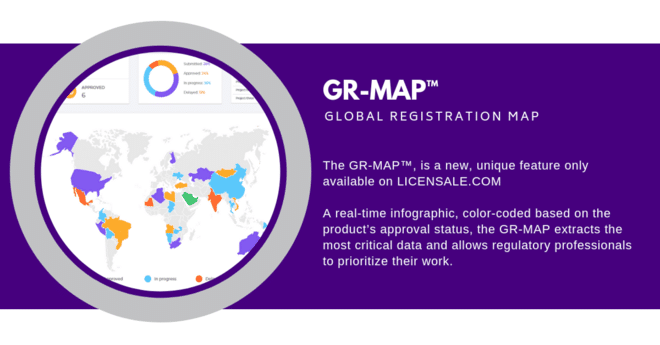 The GR-MAP is an infographic, colour-coded based on the product’s approval status, extracting the most critical data and allowing regulatory professionals to prioritize their work. The GR-MAP™’s infographical summary is in real-time and includes data critical to the medical device’s status, such as the number of documents missing and required to complete submission, the effective submission and approval dates and the product’s specific MARI% score- another feature exclusive to Licensale. In addition to the infographic, you can generate further reports to plan your product or country specific registration strategy and budget.